With world famous sites such as El Capitan and Half Dome, Yosemite and Bridalveil Falls, as well as nearly limitless opportunities for outdoor recreation, it’s no wonder this is one of the most visited national parks in the United States. Spend the day hiking one of the parks many scenic trails including Bridalveil Falls and Panorama Trail. Stay at one of the parks 13 popular campgrounds, available both by reservation and on a first-come first-served basis. Yosemite is famous for its rock climbing, consider taking a lesson from an experienced guide. Many come to Yosemite National park to see its world famous attractions such El Capitan and Half Dome, Yosemite and Bridalveil Falls, as well as the scenic overlooks of the valley. But with over 1,200 square miles of wilderness within the parks borders, these sights just barely scratch the surface of the parks offerings. Yosemite National Park is located in the central region of the Sierra Nevada mountain range in California. Yosemite NP provides a free shuttle service around the valley. The Valley shuttle operates all year from 7am to 10pm and includes stops at or near all overnight accommodations, stores, and major vistas. There are also shuttles available to El Capital, Wawona, and Mariposa Grove. The park is open 24 hours a day, every day of the year. The Hetch Hetchy Entrance is only open during daylight hours. During the winter season, from around November through May, some roads may close due to snowfall. If you’re looking for classic Yosemite scenery without a lung busting trek, take the half mile hike to Bridalveil Falls. Beginning at the Bridalveil Falls parking area, follow the paved trail to the 617 foot, year round, waterfall. This 8.5 mile hike (one way) begins at the Panorama Trailhead in Glacier Point and winds its way to the valley floor. As its name suggests, this trail offers incredible views of the park including Illilouette Falls. During the summer, return to the trailhead via the shuttle bus. 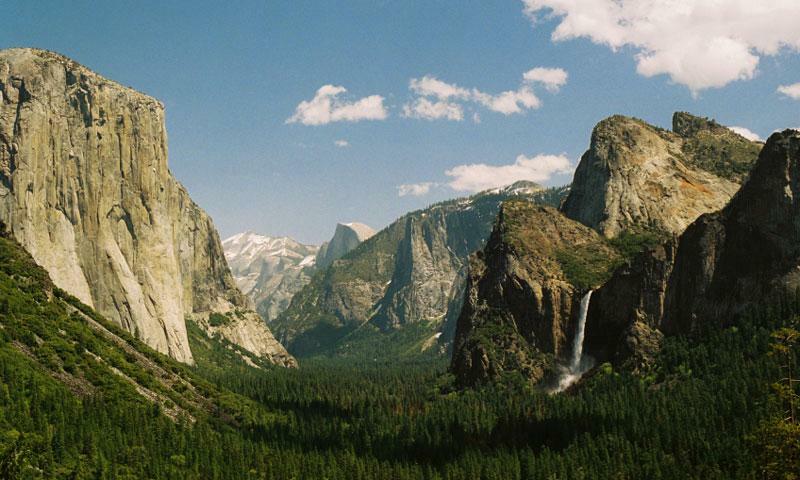 Walk to the top of one of Yosemite’s most famous landmarks. Half dome rises nearly 5,000 feet above the valley floor, which, for you the hiker, means a 14-16 mile hike, round trip. Those who are up to the challenge will be rewarded with views of Vernal and Nevada Falls, Liberty Cap, and of course panoramic views from the summit. Looking to avoid the traffic in the valley? There are over 12 miles of bike paths available. Bicycles are available for rent. Take note, no off road bicycling is allowed within Yosemite National Park. Big wall routes like The Nose on El Capitan have made Yosemite NP famous, but the valley has more to offer than big wall multi-pitch climbs. Munginella is a 5.6 route, and serves as a great introduction to Yosemite climbing. Remember that rock climbing is inherently dangerous and Yosemite climbing requires experience. Consider hiring a guide service to show you the ropes. The park boasts 13 popular campgrounds. Up to seven are available on a reservation system, while the remainders are available on a first-come first-served basis. Take note that nearly all the reservations for the months of May through September fill up the first day they become available, often times with a few minutes of 7am. The Yosemite Association encourages tourism within and the preservation of Yosemite National Park.